This is the pinwheel pattern. For the red pinwheels, I used a fabric that has baseballs on it, and the blue pinwheels are red and blue stars on a white background. Both these fabrics were new acquisitions, while the solid red, white and blues were all leftover pieces of past project fabrics from Mom, Granny and Edith. As I am making a quilt, I will try to come up with a name for it. This one felt so much like baseball and Americana – with the baseball fabric along with the red, white and blue colors – it seemed fitting to name it, Take Me Out to the Ball Game, in honor of the famous old-time baseball song. I donated this quilt to the County of Ventura, Children & Family Services, in July 2014. This year seems to be flying by! 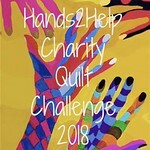 My Love Hugs quilt project has taken a back seat to some of life’s more important events, like welcoming a new grandson and a new son-in-law into the family. I made this quilt for my new grandson, Felix. The animal fabric is one that was from Granny’s leftover fabrics. I combined it with some fabrics that I had from other sewing projects I had done in past.